Let’s face it — missing teeth can turn even the most confident person into a wallflower. How could anyone feel great about a smile that reveals large gaps where beautiful white teeth should be? What Happens When Teeth Are Lost? Think of teeth as placeholders. When trauma, decay or periodontal disease causes you to lose a tooth, the surrounding teeth naturally begin to shift to fill the space. This simple action can cause a domino effect of oral health issues. Your teeth can become crooked and your bite may be altered, both of which can cause excessive tooth wear and even lead to tooth grinding and clenching while you sleep. The exposed gum tissues are also vulnerable to injury. Even worse, because the jawbone tissues beneath the gap are not being stimulated with a natural tooth root, the bone will disintegrate over time and leave you with a collapsed facial appearance. 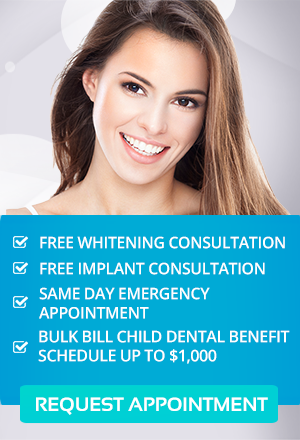 Fortunately, dental implants in Melbourne can alleviate every one of these concerns. Dental implants are artificial tooth roots made of titanium that are placed in the jawbone by a dental surgeon. After they are placed, the bone will fuse with these small posts to anchor them securely in your jaw. A small portion of the implant, called the abutment, protrudes above the gumline, and your dentist will attach a replacement tooth to it. Made of luminous porcelain and designed to match the colouration of your surrounding teeth, your replacement tooth will look perfectly natural and function the same as all of your natural teeth. Furthermore, dental implants from Melbourne dentist Dr. Halim Prayogo will provide a feeling of stability and security unmatched by removable dentures.